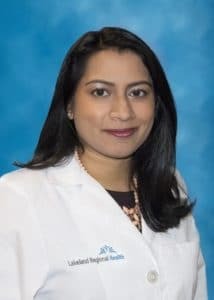 Guest post by Aarti D. Patel, MD, Child and Adolescent Psychiatrist at Lakeland Regional Health. A catastrophe, such as a violent act in school, is frightening to children and adults alike. Talking about the event with children can decrease their fear. It is important to explain the event in words the child can understand, and in a way that will not overwhelm them. Several factors affect a child’s response to a disaster. The way children see and understand their parents’ responses are very important. Children are aware of their parents’ worries most of the time, but they can be very sensitive during a crisis. Parents should talk about their worries to their children, and talk about their abilities to cope with the disaster. Pretending there is no danger will not end a child’s concerns. It is important to remember that children look to their parents to make them feel safe. This is true no matter what age your children are, be they toddlers, adolescents or even young adults. A child’s age affects how the child will respond to the disaster. For example, 6-year-olds may show their worries by refusing to attend school, whereas teens may minimize their concerns but argue more with parents and show a decline in school performance. Focus on safety and how precautions are being taken every day by parents and by school personnel. (i.e. safety drills at schools). Allow the child to talk about his or her fears. Ask questions when you feel your child is not coping well. Professional advice or treatment for children affected by a disaster – especially those who have witnessed destruction, injury or death – can help prevent or minimize mental health symptoms. Parents who are concerned about their children can ask their pediatrician or family doctor to refer them to a child and adolescent psychiatrist for an evaluation. Aarti Patel, MD, is a Child Psychiatrist who specializes in the diagnosis and the treatment of disorders of thinking, feeling and/or behavior affecting children, adolescents, and their families. Dr. Patel pays close attention to biological, psychological, and social factors as she works with each patient.